Swan Hill is a provincial city on the Murray River at its junction with the Little Murray River, about 300 km north-west of Melbourne. It is reached by rail or road via Bendigo and Kerang. The land to the east of Swan Hill has numerous anabranches of the Murray River (of which the Little Murray is the largest), and Swan Hill provided a convenient crossing point for the New South Wales Surveyor General, Major Thomas Mitchell, in June 1836, on his Australia Felix expedition. The reedy anabranches were inhabited by noisy swans, and Mitchell camped at a rise between the two rivers near which there was a grassy flat for feeding his stock. 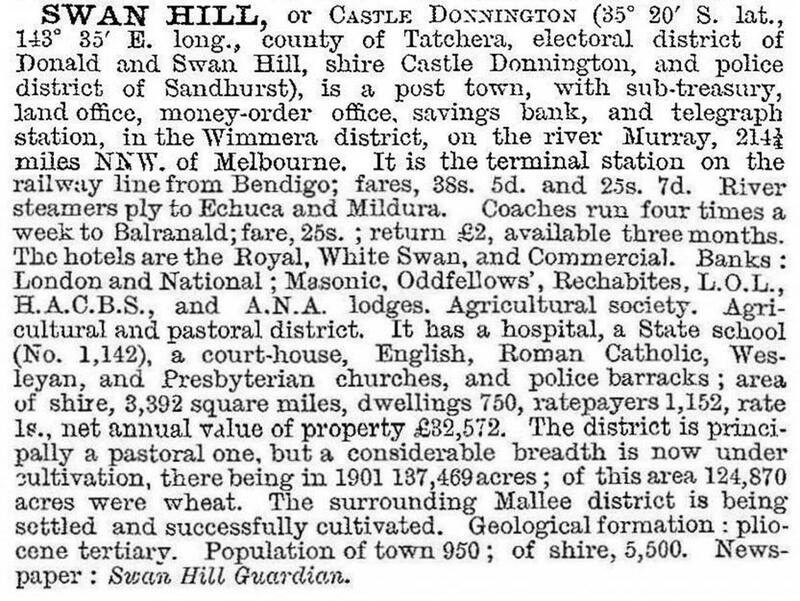 The combination of natural features inspired him to name the place Swan Hill. Mitchell’s dray tracks (the Major’s Line) offered a route for pastoralists who first chose the Lake Boga locality. Settlement occurred on the Tyntyndyer pastoral run, taken up by Peter and Andrew Beveridge in 1845, about 8 km north of Swan Hill. In 1848 a hotel was opened at the site of Swan Hill, and a river punt was built soon afterwards. River boat traffic reached Swan Hill from South Australia in 1853. A court of petty sessions was opened in the same year and in 1856 a township was proclaimed. It was named Castle Donnington, an alternative name which persisted until the turn of the century. Swan Hill was the main settlement in the Victorian Mallee. A hospital was opened in 1860, a remarkable early local initiative. Swan Hill had been the terminus of the mail run from Kerang since 1852, and it was connected to the telegraph system in 1864. In 1862 the Swan Hill District Road Board was formed, extending from the South Australian border to Cohuna. Its administrative centre was Kerang. The complicated municipal development is discussed under Swan Hill Shire. Swan Hill became the regional centre for irrigation settlements near the Murray River, Nyah, Vinifera, Beverford and Tyntynder and for Lake Boga. The Mallee hinterland was supplied with stock water from the Murray River and storages in the Grampians. A railway extension to Piangil in 1924 connected a number of these settlements to Swan Hill. Swan Hill’s primary school added higher elementary classes in 1917, and a high school was opened in 1928. A technical school was added in 1961. Steady population growth continued. In 1961 Swan Hill had 48% of the shire’s population and in 1991 it had 82%. Swan Hill’s status was raised from a borough to a city on 12 March 1965. The township’s best known attraction began when a Murray River paddle steamer ‘Gem’ was moored near the junction of the Murray and Little Murray Rivers to form the nucleus of the pioneer folk museum in 1963. (The Gem’s last commercial river trip had been in 1952). 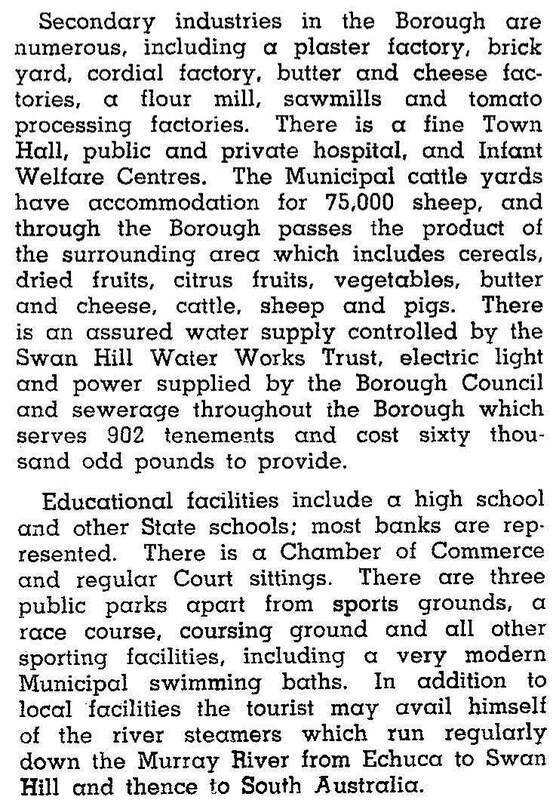 The Swan Hill Development Committee (1961) concentrated on increasing the town’s industrial growth, including distribution facilities for horticultural and agricultural produce. Swan Hill’s retail infrastructure included four furniture stores, four department stores, two variety stores and seven banks (1963). There were also two cinemas and a drive-in theatre. Swan Hill has rail and road transport facilities, and a regional airport. Its wide range of recreational facilities include a racecourse, an equestrian reserve and the agricultural and pastoral society’s showground. There are also the thrice weekly Guardian newspaper, the district hospital, regional art gallery and a TAFE. (The regional university campus is at Mildura). Swan Hill Rural City, the amalgamation of Swan Hill shire and city and part of Kerang shire, is centred in Swan Hill. The growing importance of tourism in Swan Hill’s economy was reflected in the accommodation statistics in the 1990s: in 1995 the city’s 15 accommodation establishments provided 1110 bed spaces, and there were 656 camping and caravan sites. Retailing in Swan Hill was of regional importance, the city having 33,600 square metres of floor space, three times the amount in Swan Hill shire (1986). The paddle steamer ‘Gem’ and the Deniliquin Road bridge (1896) are heritage listed. McCallum Street, which leads to the bridge, also has the town hall (1935) and the war memorial plantation. Beveridge Street has several heritage listed houses and the Uniting church. The town holds the annual Swan Hill Region food and wine festival in March.